Photo contests run through social media can be an effective way to create social engagement and web traffic for a brand. 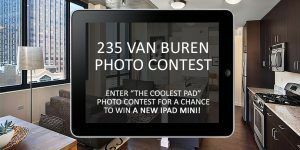 Earlier in 2013, we worked with CMK Companies, an established real estate development company in Chicago, to implement a photo sharing contest for the residents of their Chicago loop building, 235 Van Buren. We have been working with CMK Companies since July 2012 on social media for the company as well as for each of their developments. The goal was to create a contest that benefited both the residents of the building as well as anyone looking to purchase a condo in the downtown Chicago area. We decided on a strategy that would engage both groups of stakeholders-residents would submit pictures of their units for a chance to be named the “the coolest pad” and win an iPad, and the community at large could view and vote on the submissions to determine the winner. 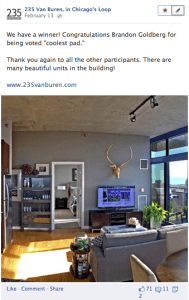 It worked really well-residents were excited about the opportunity, and everyone else loved looking at beautiful Chicago condos on Facebook. We promoted online through Facebook and Twitter, and offline through signs in the buildings. During the contest we saw a large amount of sharing (Facebook), retweeting (Twitter), and web traffic. This sharing introduced entirely new audiences to the building and to CMK Companies. To recap, photo contests can be a powerful way to drive traffic to a brand when developed and implemented correctly. Below are 5 tips to keep in mind when designing a photo contest for your brand. 1. When designing a contest, create a strategy that engages all important stakeholder groups. 2. Promote the contest heavily online and offline. 3. Give the power to your social media audience to decide the winner of the contest-this will encourage viral sharing of images, which is great for your brand. 4. Communicate openly with your social audience throughout the contest period to provide a transparent view of the process. 5. Last, and most important, make sure to familiarize yourself with and incorporate Facebook contest rules into your contest! Thanks to CMK Companies for giving us the opportunity to work with you. Please share other tips for effective contests. Would love to hear your thoughts!